Ira Hawkins, son of Newton and Sarah (called “Sally”) Hawkins, was born on 29 October 1869 in Dix, Illinois, as the second child of Newt Hawkins and Sarah Jane Claybourn. [The bulk of information about Ira and his children have been provided or confirmed by Jan Hawkins Biller, who corresponded with Joshua A. Claybourn in the summer of 2010.] 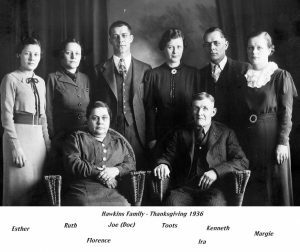 The family moved to Kansas in 1885 and homesteaded in Haskell County, later settling in Rice County, which was Ira’s home. On 27 October 1897 he married Florence Belle Holmes. [Florence Holmes was born in Portsmouth, Scioto, Ohio.] They made their home in Rice County until 1909 when they moved to the C. M. Hanna Ranch east of Jetmore, Kansas. In 1922 they moved to a farm south of town. Ira was a member of the Odd Fellow Lodge for thirty years and was an active member until his first illness in 1932. Florence died on 28 February 1937 in Jetmore. Ira passed away on 24 March 1943 at St. Anthony Hospital in Dodge City, Kansas where he had been under medical care for two weeks. Ira and Florence are buried there at Fairmount Cemetery. Ira and Florence had eight children together, all listed below. Florence and Ira Hawkins, seated, with their children behind them. Thanksgiving 1936. 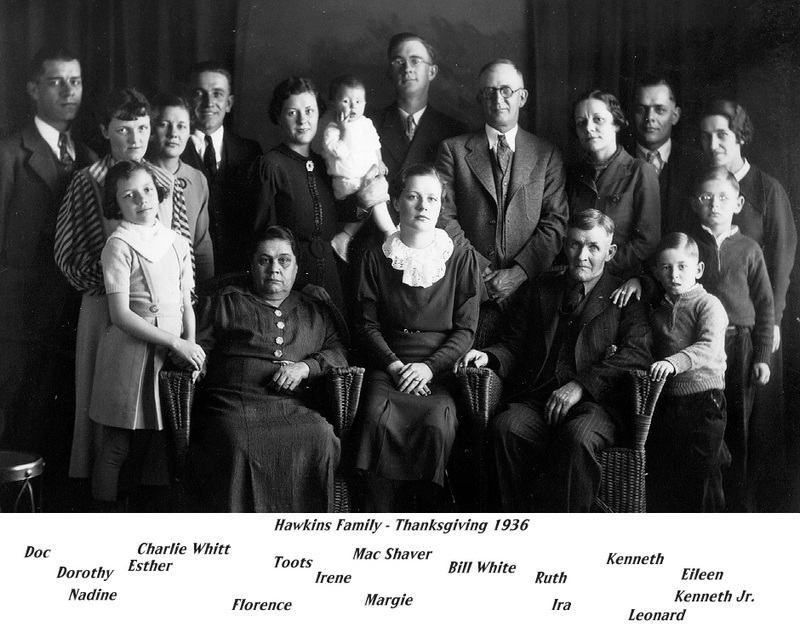 Ira and Florence Hawkins with their children and grandchildren surrounding them. Thanksgiving 1936. Chester Ives Hawkins was born on 25 December 1897 in Raymond, Kansas. He served in World War I and achieved the rank of Corporal on 22 May 1918. 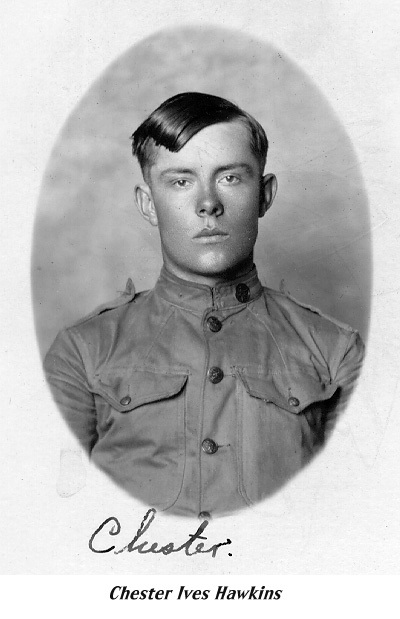 However, he died in the war not long thereafter during the Argonne Forest fight in Argonne, France, on 29 September 1918. This battle, part of the Meuse-Argonne Offensive, was one of the bloodiest in U.S. history with over 26,000 Americans killed. [Robert H. Ferrell, America’s Deadliest Battle: Meuse-Argonne, 1918 (Lawrence: University Press of Kansas, 2012).] However, the battle is largely forgotten in the United States, and the Argonne war cemetery is largely ignored by tourists. He is buried at the Fairmount Cemetery in Jetmore, Kansas. 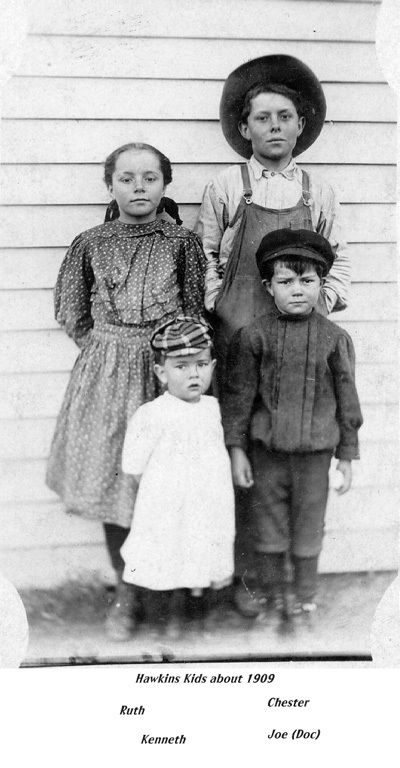 Ruth Olive Hawkins was born on 2 July 1899 in Raymond, Kansas. She married (1st) to Elmer Hunter (1897-1945) on 24 July 1919 and they divorced in about 1928. She married (2nd) to William Homer White on 6 May 1932. 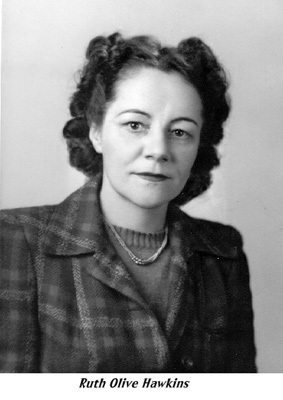 Ruth married (3rd) to Robert D. Crabtree (1909-1978) on 17 August 1942 in Bernalillo County, New Mexico. [The pair married in Albuquerque, New Mexico.] 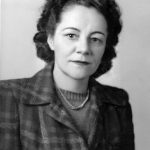 Ruth died on 17 January 1970 in Denver, Colorado. Based on Robert’s service as a sergeant in the U.S. Army, she is buried in Fort Logan National Cemetery in Denver, Colorado. Ruby Clemet Hawkins was born 2 October 1901 in Raymond, Kansas. He died at the young age of eleven on 18 April 1913 from measles and hydrocephalus. Joseph Alexander Hawkins (“Doc”) was born on 27 July 1904. He married Dorothy Delores Shearer on 9 September 1925 in Raton, New Mexico. [Dorothy Shearer was born on 21 July 1904.] Together they had two children, listed below. Joseph was a pilot and lieutenant in the Colorado Civil Air Patrol. 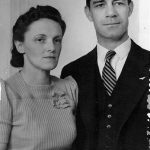 On 31 March 1942 he was set to take a woman up, but crashed during takeoff and died. Joseph Sheldon Hawkins was born on 18 October 1926 in Santa Fe, New Mexico. He died just a few years later on 28 March 1931 in La Junta, Colorado. Audrey Nadine was born on 20 December 1927 in La Junta, Colorado. She married Robert B. Bolles on 23 June 1946 in La Junta, Colorado. 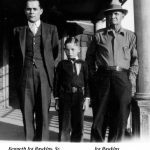 They had Ronald Kent Bolles on 29 December 1948 in El Paso, Texas. Audrey died on 21 August 1990 in San Diego, California. 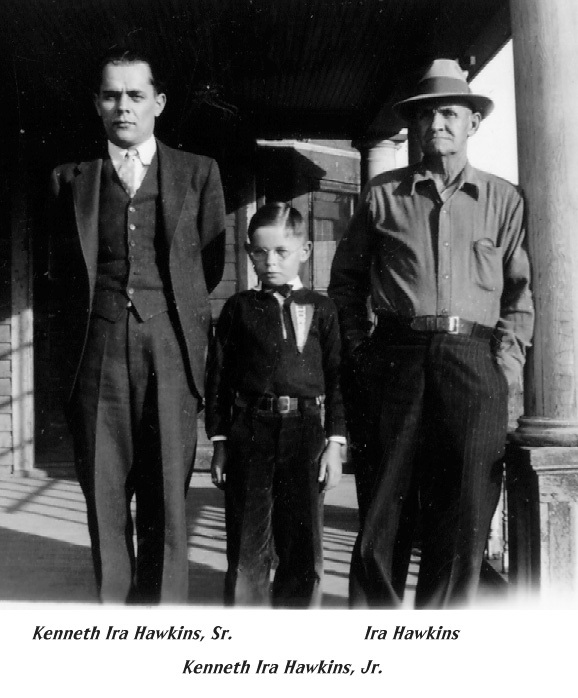 Kenneth Ira Hawkins Sr. was born on 8 July 1907. He was born “Ira Kenneth Hawkins” but said he would never be call Ira, and thus changed his name to Kenneth Ira Hawkins. He married Eileen Anita Popp on 8 December 1926. [Eileen Popp was born on 7 October 1907 in Santa Fe, New Mexico. The two married on in Santa Fe, New Mexico.] He served in the U.S. Army from March 1944 to September 1945 as a technician fifth grade and is buried in Fort Logan National Cemetery in Denver County, Colorado. Eileen died on 19 December 1978 and Kenneth followed on 21 September 1980, both in Arvada, Jefferson, Colorado. Allen Leonard Hawkins was born on 2 February 1929 in Santa Fe, New Mexico. He died on 3 June 1991 in Las Vegas, Nevada. Esther Loma Hawkins was born on 7 July 1909 on the Hannah Ranch northeast of Jetmore, Hodgeman Co., Kansas. A lifetime area resident she was a legal secretary, and worked at Hubbell Abstract. She married Charles Lewis Whitt on 18 August 1932 in Cimmaron, Kansas. [Charles Whitt was born on 6 June 1909 in Gallatin, Missouri and died on 13 May 1978 in Wichita, Kansas.] Esther divorced Charles on 7 April 1970 and the two had no children. Esther was a member of the Baptist Church, American Legion Aux., Eastern Star, and Rebekah Lodge, all of Jetmore. Esther died on 20 November 2004 in Jetmore, Kansas at the Hodgeman County Long Term Care Center. Her funeral was held at the United Presbyterian Church in Jetmore, and she is buried there at the Fairmount Cemetery. 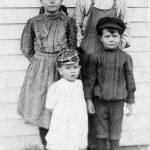 Florence Irene Hawkins (“Toots”) was born on 12 September 1913 on the Hannah Ranch northeast of Jetmore, Hodgeman, Kansas. She married Paul Mack Shaver on 21 February 1935 in Santa Fe, New Mexico. [Paul Shaver was born on 22 February 1912 and died on 8 November 1986 in Little Rock, Arkansas.] The couple lived in North Little Rock, Arkansas, but then moved and and constructed an efficiency apartment in place of the carport of a house in Ward, Arkansas. Toots died on 12 January 1994 in North Little Rock, Arkansas. She and Paul had two children, listed below. Florence Irene Shaver was born on 25 March 1936 in Santa Fe, New Mexico. She married Herbert William Brill (1931-2006) on 7 December 1957 in Ft. Smith, Arkansas and they had six children together. Herbert served as a lieutenant colonel in the U.S. Army in Korea and Vietnam and is buried in Arkansas State Veterans Cemetery in Pulaski County, Arkansas. Paul Mack Shaver, Jr. was born on 25 January 1940 in Grand Coulee, Washington. He was married four times. He married (1st) Frances Fletcher Smith in 1960 and they had two girls. Paul married (2nd) Lorretta Anama in about 1969 and they had one girl. He married (3rd) Lee Ann Overton in 1975 and they had two boys. Finally, he married (4th) Lynda Glenn but they divorced in Wood County, Ohio, on 4 February 1998. Margie Lorene Hawkins was born on 13 December 1915 on the Hannah Ranch northeast of Jetmore, Hodgeman, Kansas. 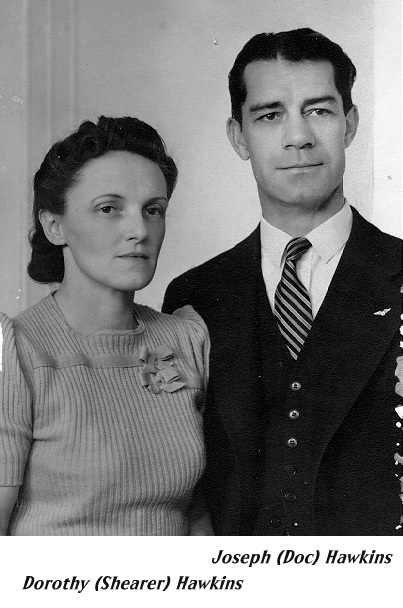 She married Lindale “Buster” Keating on 3 August 1942 in Jetmore, Kansas. [Buster Keating was born on 16 December 1915 in Gainsville, Texas and died on 14 April 1982 in Austin, Texas.] Margie and Buster adopted Robert Leonard Keating (born 9 August 1946 in Tokyo, Japan) in 1954 in Tokyo, Japan. Margie died on 6 July 2001 in Austin, Texas and she is buried there with her husband at the Austin Memorial Park Cemetery.